The new year may have officially started, yes. But Chinese New Year has yet to make its appearance. In fact, it’s right around the corner. First, what is the Chinese New Year? This year in Thailand, the Chinese New Year is celebrated on February 5, 2019. Other names for this holiday include the “Lunar New Year” or the “Spring Festival”. So why is a Chinese holiday celebrated in a Southeast Asian nation like Thailand? Taking a closer look at Thailand’s demographics, you will find that up to 15% of the country’s population are of Chinese descent. The majority of Thailand’s Chinese populations can be found in Bangkok’s iconic Chinatown, which also happens to be a prominent area where Chinese New Year is often observed and celebrated. 1. Don’t You Dare Swear! Avoid saying bad words, talking about ghosts and just anything that is bad in general. Basically, don’t talk about anything negative or anything bad that’s happened in the past. Instead, you turn your focus to the good things that are bound to happen in the future. That’s the key to a year of good fortune. Crying on Chinese New Year’s is believed to bring you sadness for the entire year. As we all know, that is probably one of the last emotions we would like to feel. So remember, keep those eyes dry and keep those tears away. If you happen to feel down and want to cry on that day, cheer yourself up by helping yourself to a movie, preferably a comedy, which you can catch Paragon Cineplex, 5th Fl, Siam Paragon. Instead of crying, you might smile or, even better, laugh. 3. Avoid Knives and Scissors. 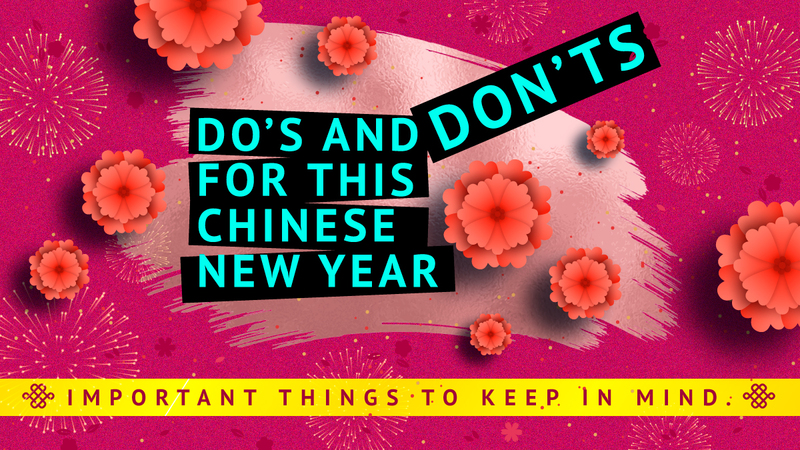 Using knives or scissors during Chinese New Year for any purpose is strongly discouraged. As the purpose of these tools are to cut, including cutting hair, use of them on the holiday is believed to cut off any good luck that may be coming your way. Therefore, getting haircuts is strongly discouraged, as scissors are required for the task. The better option is to get your haircut some time before Chinese New Year. You can get that haircut at BARBERFORD, M Fl, Siam Discovery. Using scissors also symbolizes fighting with others. 4. There Can Be No Black or White, Only Red. In Chinese culture, black and white are the colors associated with tragedy or misfortune. These are the colors that are usually worn in tragic events such as funerals. Consequently, wearing black or white clothing is a big no-no during Chinese New Year. Red is believed to be a lucky color. Therefore, people will wear red on Chinese New Year’s, especially at family gatherings. That’s also why the money envelopes people hand out are red. Now if it so happens that you don’t possess any red clothing, you are likely to find an abundance of them at ALAND, 2nd Fl, Siam Center. Happy shopping! 5. Keep Your Money to Yourself. It is believed that if you let someone borrow money on Chinese New Year’s, you will be faced with more and more borrowers throughout the remainder of the year. Some of them may pay you back. Some of them won’t. On the other hand, also make sure to return any money that you may owe anyone. 6. Breaking Things? Not In My House. When anything is broken inside the house, it serves as an omen that something bad is about to happen to a family member or loved one. You’ve probably heard of this kind of saying before in other superstitions. Therefore, be very careful around the house on Chinese New Year’s. On the morning of Chinese New Year’s, make sure you don’t go into other people’s bedrooms to wake them up and greet them. The belief goes that the one you’ve woken up will have to work to exhaustion throughout the year. You wouldn’t want that on your conscience now, would you? There is a long-standing belief that doing house chores on Chinese New Year’s will bring about bad luck. How long? Oh well, about one year’s worth. Doing house chores or any form of work on Chinese New Year’s is a symbol of going through hardships for the entire year. Now that is good way of avoiding your chores. Here’s an idea, why don’t you do your chores the day before or a few days before? The Dyson V8 vacuum cleaner would be a great addition to your house-cleaning kit and will help get your chores done quicker! You can get one at the Dyson shop, 2nd Fl, Siam Paragon. It is bad luck to buy new shoes on Chinese New Year’s. The reason being that it is related to the language. For the Teochew Chinese ethnic group in Thailand, the word “shoes” in the Teochew language is “hoi”, which has a similar sound to the word “hai” (Teochew for “sigh”). Sighing is representative of stress and that would mean you are already stressed at the beginning of the new year, which isn’t the best way to start the year. If you do feel the need to buy new shoes, either buy them before or after the actual New Year’s day (which is February 5). There’s a wide selection of footwear to choose from at Villains SF, M Fl, Siam Center. For the men, there’s also a Dr. Martens shop nearby, M Fl, Siam Center. 10. Congee Not on the Menu. In the past, the less fortunate families of China could only afford congee. In the present, congee is considered inappropriate to be served as the first meal of the new year. The ideal food for a New Year’s meal would be the leftover food from New Year’s Eve. This is symbolic of having more than needed, according to the belief of the Chinese. So now that you know that doing chores on Chinese New Year is bad luck, get out of your house and enjoy the festivities that await at OneSiam! Shop or eat, the choice is yours. Take a trip through Siam Paragon, Siam Center or Siam Discovery. In other words, give yourself a break this Chinese New Year!